Author’s note: This is a continuation on my series of trekking La Vanoise National Park in the high Alps of France. To see all posts in this series, click here. 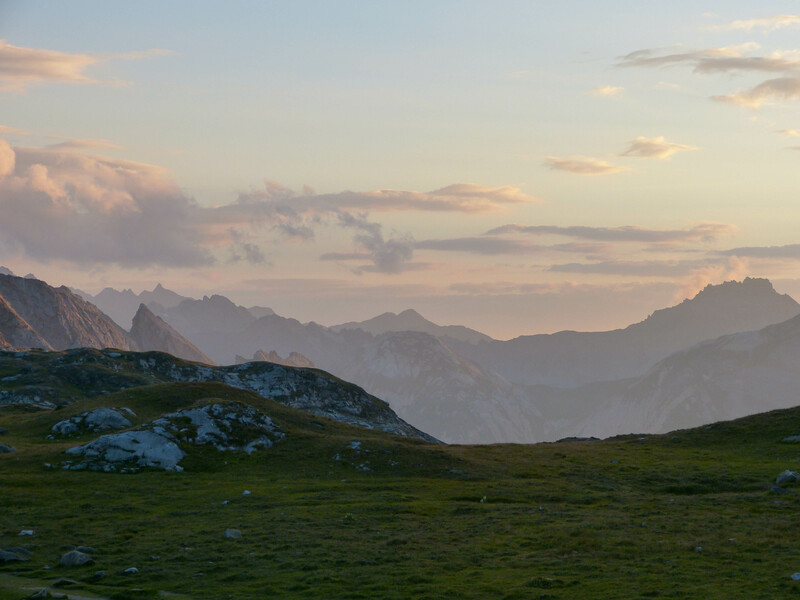 Sunset over Col de Vanoise. If you have never been on a mountain hiking trip before, you probably haven’t been properly introduced to “les refuges” or mountain huts. Over the years of my travels, I have stayed at many, some nice and others not so nice. Mountain huts are generally basic shelters in which hikers can sleep and eat for the night at a relatively low cost. Normally mountain huts are quite rustic either with or without electricity, running water and adequate “loo’s”. The nicest one I’ve ever stayed at was in Chile’s Torres del Paine National Park. This refugio (as it is called in Spanish) had heated indoor showers, “Western” toilets, decent food and separated bunks. Some of the worst I’ve stayed at were in Nepal and Peru where a real live toilet was around the bend, under a bush and electricity was a distant dream. 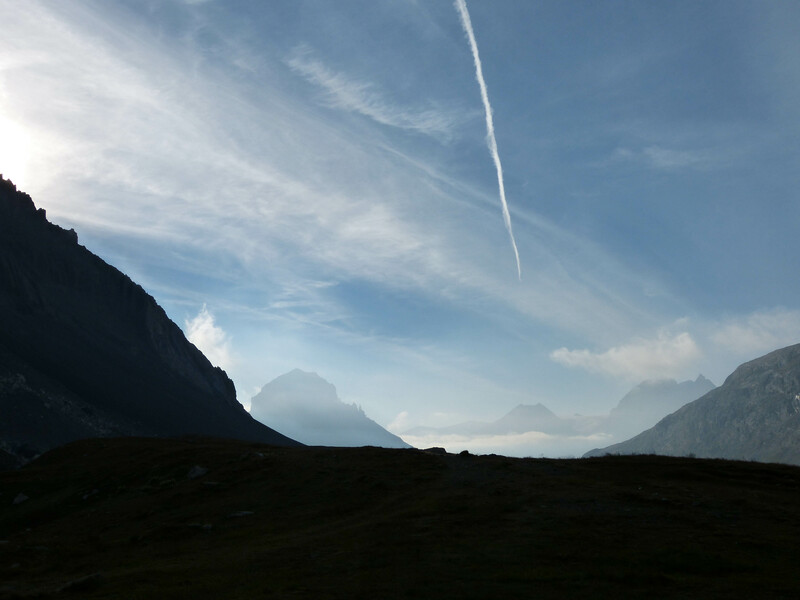 Upon signing up for the Tour de la Vanoise six-day trek, I honestly had no idea what to expect. I had never stayed in a French Alpine refuge before and somehow secretly pictured delicious, decadent meals served with fine wine, and dreamy white down comforter duvets spread across the beds. Where on earth I came up with these ridiculous illusions of French decadence, I do not know. Perhaps my imagination was playing tricks on me. Given the rustic accommodations of Nepal, I had turned a mountain refuge in France into a four-star hotel, all within the simple confines of my head. 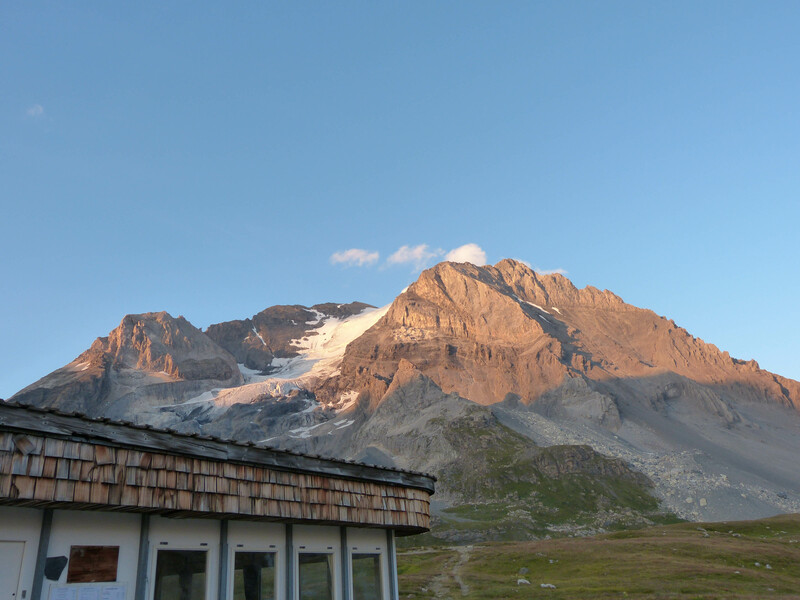 Our refuge at Col de la Vanoise, rustic yet with a gorgeous, surreal mountain view. 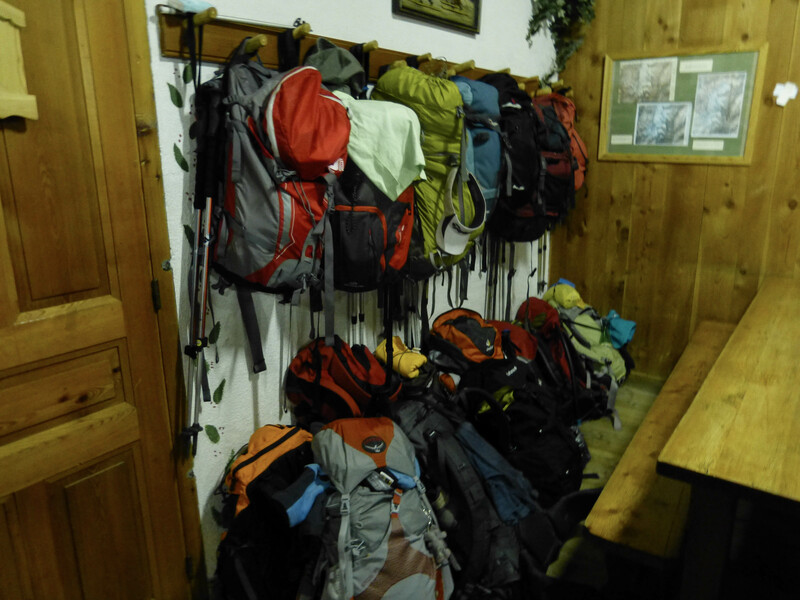 The first thing you do when you arrive at a mountain hut is check in. Our charismatic guide Mark took care of everything. He got our bunk location for the night, our token for our 3-5 minute shower, and showed us the critical parts of the refuge: Sleeping room, outhouse, shower room, storage and the “hot” shoes (there is a bin at the front entry to each refuge with piles of plastic crocs in bins by size. These are the shoes you must where inside the hut, not your filthy hiking boots and the smell in the shoe room is not pleasant). 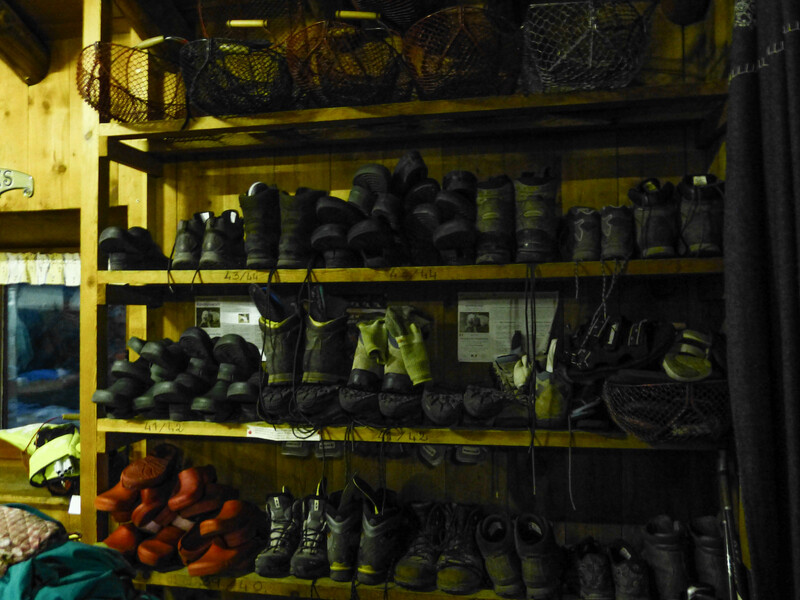 Hiking boot storage along with the hot shoes (these ones aren’t separated by size in bins. It is a free for all). Beware!!! This room stinks!!!! 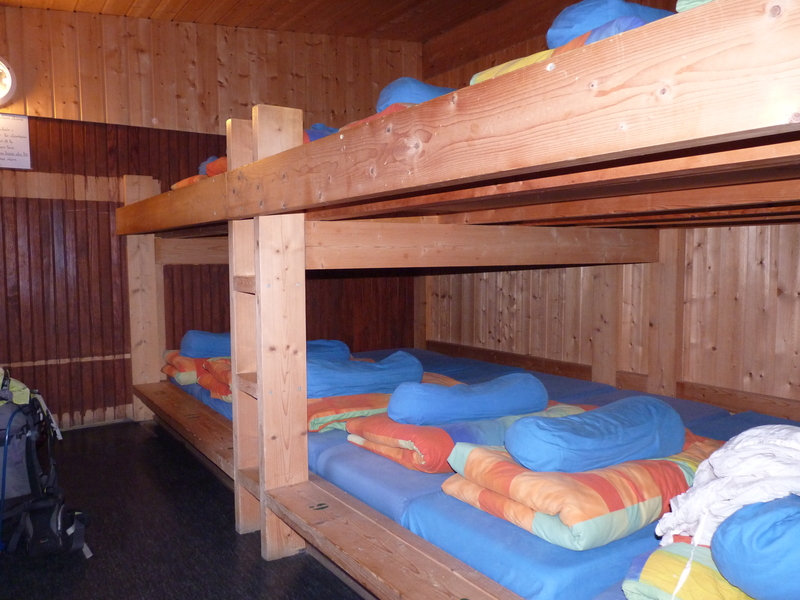 Backpack or “rucksack” storage, directly outside the door to the bunks. After the mini-tour, the next thing I desperately wanted to do was take a shower, preferably one that was hot. I learned rather immediately in Nepal two important things about shared showers: One, it is best to be there early, no later than three, if you don’t want a long queue. Two, it is best to be there early, if you want hot water! Given my experience with shared showers, I grabbed my shower token, gathered my plastic ziplock bag of limited weightless supplies and went straight to the shower room. My plan had paid off. No one was there expect for my dad who also comprehended the importance of a timely shower, and I got my 3-5 minutes worth of hot water. It was great except for trying to dry off with a pint-sized travel towel and get dressed inside a minuscule shower stall desperately hoping I wouldn’t accidentally drop my fresh new clothes into the stalled water below. Next on the list included the well-deserved happy hour (for didn’t I earn this after a long, hard day of hiking?). I had hydrated myself all day long with an endless supply of water and now it was time to kick back, take off my hiking boats and drink some silky smooth French wine. 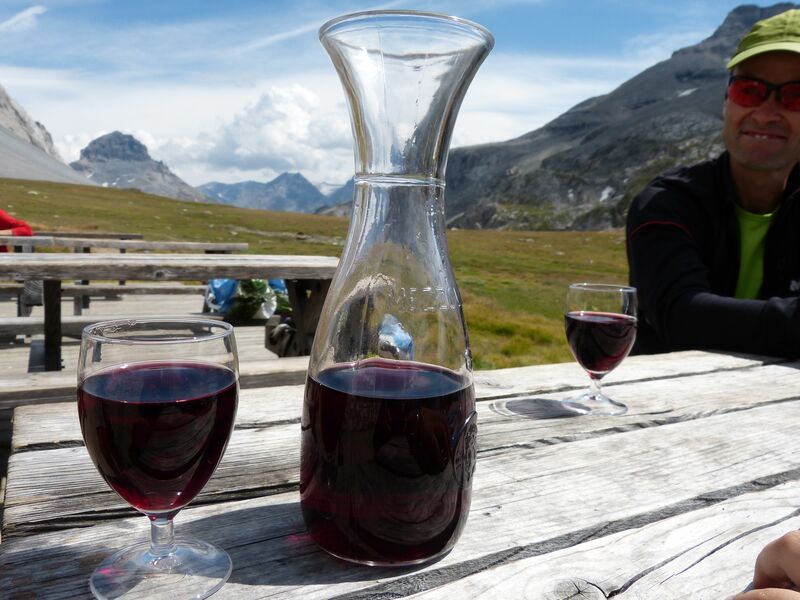 One of the huge perks about hiking in the French Alps of Savoie is the availability of delightful, affordable, hard-to-find French wines. A bottle of Vin de Savoie usually cost less than $15 and is almost impossible to find at local wine stores in the U.S.
After an extended cocktail hour which perhaps included far too many glasses of wine for me, my dad and our friendly guide Mark (we all ended up being the boozers of the trip), it was time for our group dinner. The meal wasn’t anything to write home about yet it was freshly prepared and relatively nutritious. 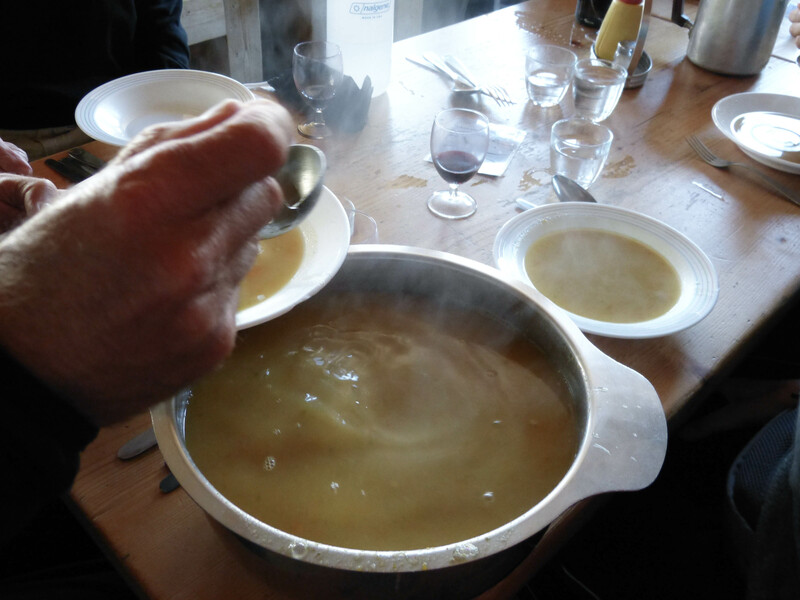 The soup was made from scratch and delightful.What made the meal so wonderful is that after the main course, we got our own chunk of cheese (fromage de region) to savor and the slices weren’t small. At a refuge, meals are typically served at two different times depending on the size of the dining space and the amount of guests. Some refuges offer separate tables while others have long, cafeteria-styled tables where you all pack yourself in. The food is always served family-style and if you take an extra piece of bread or slice of cheese before anyone else has finished their ration, you are looked upon as a thief. I learned early on the importance of patience when it came to extra food. Mealtime was a loud, festive event with many happy trekkers sharing their jokes and stories from the day. But by nine o’clock, it was time for bed. For lights go out early at a mountain refuge and thankfully almost all trekkers appreciated and respected this unwritten rule. Watching the sun set before heading to bed. Note the clothes line in the foreground. Each hut has its place to hand wash your clothes and set them to dry for the night. A necessity when you pack lightly and only bring a few things for the week to wear! 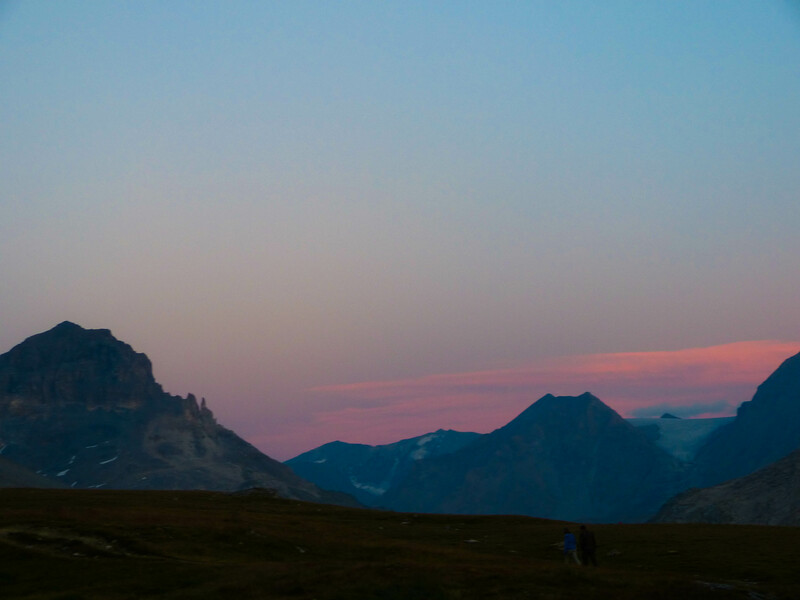 A gorgeous sunset over the Col de la Vanoise. Before heading off to my assigned bed for the night where I’d be spending the night along with 40 strangers, I went to fill my water bottle, grab my flashlight and brush my teeth. The bathroom stank of urine and other unmentionable things (there were only two toilets for 100 residents). I tried my best not to spend too much time inside (nor did I take any pictures as we all know what an unclean, highly used squat toilet looks like). I reached inside my ziplock bag of toiletries, searching for the one other necessity I packed other than ear plugs that would ensure a good night’s sleep, and a moment of moment of panic struck. They weren’t there. I dug and dug inside the large plastic bag, frantically searching to no success. In a frenzy, I dumped the contents of my week’s toiletries onto the dirty floor. I searched and searched yet found nothing. I almost wanted to cry. Where on earth were my over-the-counter sleeping pills? How in the hell was I supposed to sleep? I have always been a light sleeper especially since becoming a mother. Every single noise seems to wake up my alert ears. The sad reality is that without sleep, I’m an absolute train wreak. I learned this over the years of endless sleepless nights with a colicky baby. The only saving grace at the refuge was the wine. The fact that I drank many glasses of savory Vin de Savoie would hopefully work to put me to sleep and be my savior. Maybe I didn’t have to have so much remorse about drinking so much? I decided. “Who cares about the bad effects on my liver, if I can get a good night’s sleep than everything will be great!”. I entered my room of 40 and found bunk number 35, climbed up to it and turned out the light. My dad was on the right of me, not even a foot away, and Christine’s fourteen-year-old son Jonty was on the left. The rest of the 36 people crammed into the long, narrow room were complete strangers. Here is the room for 40 people! The four of us (me, my dad, Christine and her son Jonty) had a row of four beds on top. The other 36 beds in the room were strangers. By nine fifteen, the remainder of the people who weren’t already inside sleeping, entered the room, amazingly quiet and respectful. I popped in my ear plugs and quickly forgot about the missing sleeping pills. Within minutes I drifted effortlessly off to sleep. About three hours later I awoke to the desperate need to use the loo. I grabbed my flashlight and untangled myself out of my sleep sac. I was half awake but tried my best to quietly climb down the steep steps of the ladder to the bunk, and tiptoe out of the room without waking a soul. Success. I reached the stinky bathroom and made a rookie mistake. As I pulled the flush on the squat toilet, I forgot to use the “jump technique” and my hot shoes got soaked in my own urine. Hmmm….now that is pretty gross. I rinsed my feet off as best as I could, thankful these weren’t my own shoes, and then headed back to bed. That is when the nightmare began. Once the alcohol-induced slumber wore off, I realized how incredibly hot and loud it was in the room. There was snoring, there was coughing, there was frantic calls in someone’s sleep and there was farting. I wanted to laugh but I also wanted to cry. How would I ever fall back asleep to this strange concoction of noises and smells? It was going to be tough. I tried changing my sleeping position around so I was head-to-toe with my dad (a huge offender on the snoring) and Jonty (who cried endlessly at night in his sleep). An hour later of tossing and turning, and I was still awake. It obviously didn’t work. I tried climbing out of my sleep sac again, down the precarious ladder and out the room to grab my only pullover and use it as a sound barrier around my head. I even tried tying the sleeves around my ears to drown out the noise. But that didn’t work either. By this time it was three am. I tossed and turned some more, trying not to panic. Then it was four am. Should I get up and read? But then I remembered (a) I didn’t pack a book as it would have been extra weight to carry. (b) There was no where in the refuge to go and read. I was trapped. Anxiety and panic really began to set in. How would I manage to hike six hours on no sleep? I was ready to cry from frustration and fatigue. It was the night from hell. Somehow I managed to fall asleep by six am. People who were off to summit the high peaks surrounding Col de la Vanoise were already well gone. I slept hard for an hour and a half until my dad shock me and said there was only five minutes left of breakfast. I’m embarrassed to admit that I started to cry. But somehow, I pulled myself together on three hours of drunken sleep and made it to breakfast. It wasn’t a good way to start off the trip! My only hope was that it would get better. 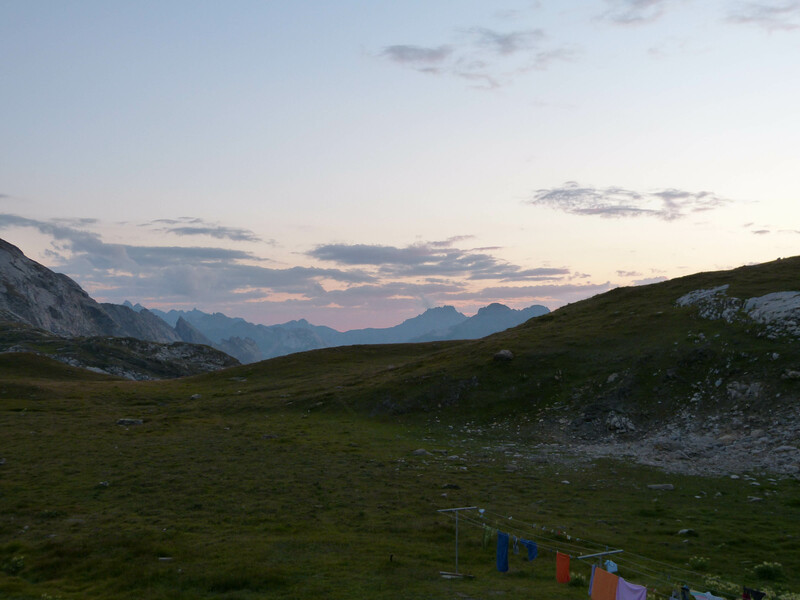 As I pulled on my pack and filled up my water, the sun began to rise over the Col de la Vanoise. Despite my fatigue, I smiled. I’d survive. It was only one night. I was in France, and I was going to enjoy it, sleep or no sleep. It was time to toughen up and stop complaining. Stay tuned…Day 2 hike coming up next with lots of fabulous pictures! I skipped some because I was avid to see more of those views, Nicole. Awesome photos. Thanks Jo! I wrote quite a lengthy ordeal and it can get long and cumbersome. More photos to come!!!! Yikes. Not sure if I am sold on the idea of hiking (super light super thanks to baby! who is now 3). Next time you are in France I will drive to you with sleep aids and warm slippers. Thanks! It is crazy and guess what, there were a few families at the nearby huts (the first one was only four hours walking). No real young ones though. I can totally relate to your fear/anxiety of non-sleep. I struggle with it also and it keeps me from being more adventurous sometimes or at least being able to relax during my adventures! Looking forward to seeing how your hike went. Thanks! I will get back to writing about it soon…..and no worries, the rest went well except there was one more “night from hell” story to be told! Stay tuned…. I bet so Jo! I told you Kili is on my list. Got to do these things before I don’t want to, right! had a terrible time like you once in NZ, too many people, a huge spanish dude that snored like hell, bugs in a scary amount, it can get so depressing.. you made it though! Ahhh…..I guess it must be part of the deal! Next time I’m for sure packing my sleeping pills so I can knock myself out and erase away all those “unmentionable” annoyances! Thanks for sharing! Loved every word 🙂 And those vistas are just stunning. Thanks Nicole. What a nice blog to come across! This sounds like an amazing trip, great to get a first hand perspective on what those huts are like in between long days of hiking. Thanks for stopping by! More on this adventure coming soon!